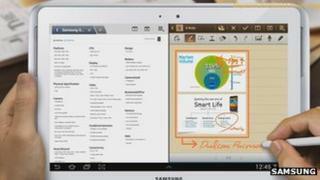 Samsung has launched a new tablet, the Galaxy Note 10.1. The release comes midway through a patent trial involving the South Korean firm and Apple, in which each company has accused the other of copying its technology. In addition Samsung has opted to retain a look it introduced in 2011 placing wider bezels along two of the device's sides. The feature was created after a German court temporarily banned earlier models for infringing Apple's tablet design. The significance of this is that Apple is seeking damages in the California trial claiming that its rival's original Galaxy Tab computers were "confusingly" similar to its own. Samsung rejects the accusation saying Apple's US design patent showed "little more than a blank rectangle", and it would go against legal precedent to allow it to monopolise the shape. According to analysts at IHS iSuppli, Apple had a 69.6% share of the global tablet market in the April-to-June quarter, compared with Samsung's 9.2% share. Among them was Dr Woodward Yang, an electrical engineering professor from Harvard University, who backed Samsung's claim that Apple had infringed patents involving sending photos by email and playing music in the background. Samsung also took evidence from Jeeyuen Wang, one of its designers, who rejected claims she had made reference to or copied the look of Apple's iOS system app icons. Apple's lawyer then showed the court documents signed by Ms Wang which featured side-by-side comparisons of the two firms' interfaces. The evidence is intended to suggest that Apple's designs were not unique and therefore do not deserve patent status. Earlier this year a court in the Netherlands rejected a claim that an early Galaxy Tab computer had infringed Apple's design rights after hearing about the Knight Ridder effort. Apple is claiming a total of $2.5bn (£1.6bn) in damages claiming seven patent breaches in addition to other trade violations. The judge could triple that figure if she decides to punish Samsung for wilful misconduct. For its part the South Korean company is demanding a "reasonable royalty rate" for five patents which it claims Apple has infringed. "I see risk here for both sides if we go to a verdict," the judge said according to a transcript provided by Forbes magazine. "I think it's worth one more attempt. If you could have your CEOs have one last conversation, I'd appreciate it."